Fruit Dart is one of the fun games you can find on MPL which does not require a lot of skill or practice but can win you a lot of awards and rewards. It is a fruit shooting game in which you throw darts at the fruits tossed randomly on the screen and score points. Only watch out for the occasional bombs. You can download MPL app from play store or directly from the MPL website to play Fruit Dart and hit those yummy fruits like a pro. Keep on scoring as much as you can and stand a chance of winning a tournament. Available in both tournament and 1 vs 1 battle mode Fruit Dart is becoming a favourite among players of all ages. Read more about the game in this article and increase your chances to earn money by shooting darts and aiming at fruits on your phone. Your aim is to hit the fruits that are thrown on the screen with the knife and score high. Random fruits are thrown from the sides of the screen. You are provided with a basic knife, which is your dart, at the bottom of your screen. You can tap anywhere on the screen to throw the knife at the fruits. There are no lives for this game but a time limit is set for each game. The player needs to throw darts at the fruits as much as possible and score high within the stipulated time. Live bombs are randomly thrown in between the fruits. If you hit a bomb the game ends. All fruits give you same number of points. If you are able to hit multiple fruits in a single hit (called as combo), you get bonus points. Missing a fruit will not end the game, but the bombs are your enemy. Once you join a tournament, you can play as many times as you want during the tournament. Your highest score would be taken into consideration for the final calculations of the rank. Players are rewarded on the basis of final rankings once the tournament ends. This game is also available in battle mode where two players battle out against each other. Both players start the game at the same time and keep scoring until one of them loses by hitting the bomb or completion of time, whichever is earlier. The player who scores more wins at the end of the battle and your earnings are credited to your account immediately. Tournaments : In the MPL app select the fruit dart game. You have a number of tournaments to select from. Look at the tournament details and select one according to your liking. Once the fee is deducted, you can start playing fruit dart. Play unlimited number of times to improve your score while the tournament is live. Winners are rewarded as per the final ranking after the tournament. To join a tournament earn tokens or add cash to your wallet if you have downloaded MPL pro app. 1vs1 Battles : Go to the battles tab in MPL app and select Fruit Dart. There are many battlerooms and you can choose one based on your preference. You are then matched with an opponent and the game begins. The player scoring higher in a battle takes home the winning amount. You can play for cash for higher winnings or play in token rooms. 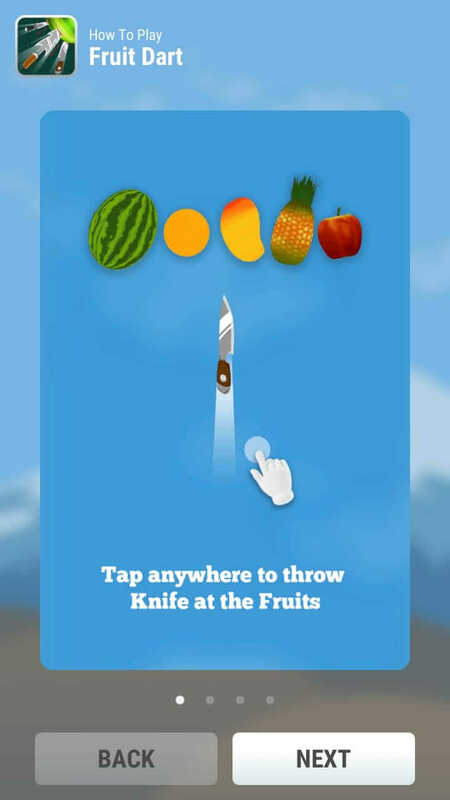 Game Play/Controls : Once the game starts you can tap the finger anywhere on the screen to throw the knife at fruits. You have to shoot and pierce the fruits in order to keep on scoring. Although missing a fruit will not end the game, hitting a bomb will certainly do so. There is a timer so you need to hit as many fruits as possible within the given time. Scoring : Each fruit is worth 5 points but if you are able to hit multiple fruits in a single hit you get bonus points. You get 12 bonus points on a combo of 2 fruits, 20 bonus points on slicing 3 fruits at once, 30 bonus points for 4 and so on. 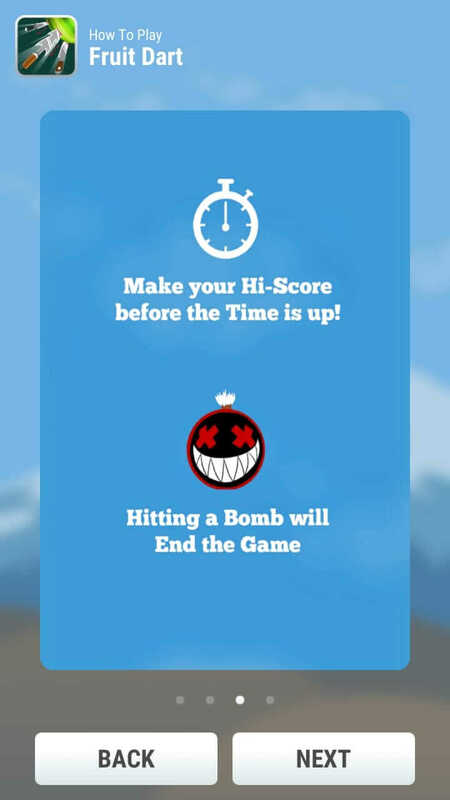 Game End : The game ends if you hit a bomb or the time ends. Power Ups: You are provided with 5 different powerups throughout the game. Small knife: This knife may seem small but it is sharp and can pierce fruits just the right way. This can be useful when there is a bomb in the air along with other fruits. You can easily pierce the fruits and avoid the bomb with this small knife. Long knife: This one helps in making a big combo as it has the ability to go through many fruits at a single shot. Shuriken: This multi-blade dart knife is helpful but tricky at the same time. You need to be careful while using this one. A Shuriken, once thrown, goes in multiple directions in more than one dart. It works wonders when there are multiple fruits on the screen which are scattered all over. But avoid using this dart if there is a bomb on the screen otherwise you increase your chances to hit the bomb and end the game consequently. 2x Speed: This power up increases the speed of the fruits thrown on the screen. Although it increases the chances of scoring high as more fruits are thrown you need to be extra careful of the bombs which are thrown at double speed as well. Shield: One of the best power ups of all, it provides a protection against the bombs in the power up time. Note: If you have already acquired a power up and hit another power up during the game, the earlier one is lost and the new one is taken over disabling the former. 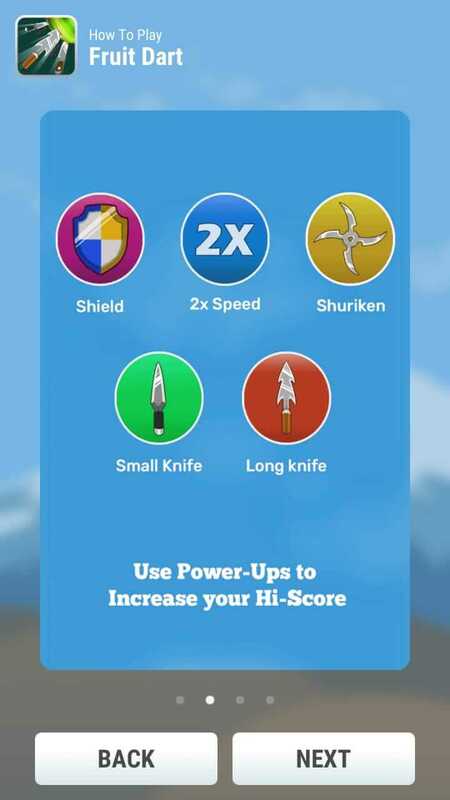 These powerups are also tossed along with the fruits and you need to hit them with your knife in order to achieve them. These last for only few seconds so make the most of it while it lasts. Use these to achieve high scores. Score Bonus Points – Try to make bigger combos for higher bonus points. Missing fruits does not end the game, but hitting a bomb does. You can tap anywhere on the screen to hit the fruits so don’t limit yourself to the one bottom position. Use powerups to increase your score. Use the Shuriken power up carefully. Choose a tournament / battle room according to your skill level. Some tournaments are easy and less competitive. Now that you have understood this game completely, go and earn money on MPL app by playing Fruit Dart. If you like playing this game, don’t forget to create a shortcut for fruit dart on your home screen. If you have any questions or suggestions please let us know in comments below.